I know all you die-hard racers are chomping at the bit, scowering the interwebs looking for scraps of information on the upcoming (July 11th) MWFTCS OMBA Caramba mountain bike race at Sac River trails in Springfield MO. Well, rest easy because I've got you covered. The secret is out and the course has been marked and although I'm not supposed to let the "out of towners" know what the exact route is, I'm going to break the silence and help you prepare yourself mentally and physically for what is going to be a true test of your mountain biking mettle. The lap distance is 7.25 miles (or 11.69 kilometers) and you can count on it taking about an hour to complete for beginners (if they make it at all), and 40 minutes for expert (not counting tire changes and resting periods) with sport somewhere in between. The race will have Beginners do 1 lap, Sport 2 laps and Expert has to suffer through 3 laps. Oh, and either load your tires with Stans or bring lots of tubes. The thorns are out in full force. If you don't hear from me again then Scott or Ryan reads my blog. Luckily I think I'm safe with that. 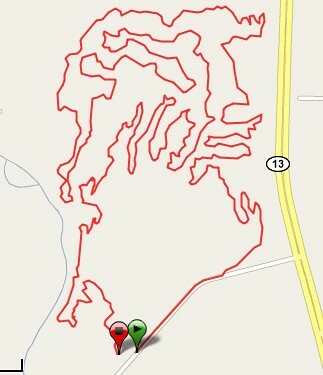 Man, that looks like ~2000ft elevation gain per lap. Is that right? How does the climbing compare to the castlewood state race? Can't find directions on MWFTS website. Can you help. Parking is available at the trailhead located off Highway 13, three miles north of I-44. Watch for the brown highway sign marking the westbound turn-off. The trailhead is located just around the bend on the north side of this un-named road.